Dr. William Dale (Bill) Cyphers, III of El Dorado, Arkansas, died November 28, 2018. He was born June 9, 1924 in St. Louis, Missouri to Esther L. Kauffman and William Cyphers. 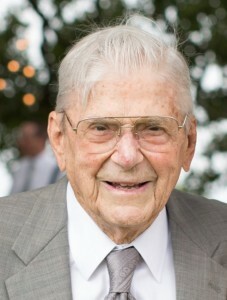 Dr. Cyphers was a lifelong resident of El Dorado graduating from El Dorado High School in 1941. He attended Hendrix College and A & M in Monticello, graduating in 1946 from the University of Tennessee College Of Dentistry. Bill served in the Navy from 1942 until 1946. He was reassigned to active duty as a Captain in the U.S. Air Force from 1951 to 1953 at Luke Air force Base during the Korean War. Dr. Cyphers was active in dental organizations serving as President of the Union County Dental Society and the South West District Dental Association. He also served on the staff of the Medical Center of South Arkansas for thirty years. His professional fraternities included Delta Sigma Delta and Delta Alpha. He was awarded a fifty year pen as a member of the Arkansas State Dental Association in 1996. He was member and usher of St. Mary’s Episcopal Church of El Dorado. He was a member of the El Dorado Kiwanis Club for twenty one years. He was preceded in death by his beloved wife of 69 years, Mary Helm Cyphers and children, Dr. Mark Cyphers and Beverly Ann Cyphers, and his long time hunting friend and brother, Dr. Charles D. Cyphers. Survivors include one son, Will Cyphers of Camden (Lucy), and daughter – in –law, Pam Cyphers of Little Rock. His five grandchildren include, Brooke Cyphers Hicks (Tim) of Little Rock, Brian Cyphers (Jessica) of Dallas, William Cyphers (Amanda) of Bossier City, La., Amber Cyphers McGhee (Tyler) of Fayetteville, Leah Cyphers Youngblood (Jim) of McGehee. Great grandchildren include Eli, Hudson, and Harper Hicks of Little Rock, Ryleigh Cyphers of Dallas, Lucy McGhee of Fayetteville, Lillian Cyphers and Madalynn and Blake Andrus of Bossier City, Louisiana. He enjoyed hunting and fishing with his son, Will, and grandsons, William and Brian Cyphers, and his dear friend, Dr. Don Goodwin. He also enjoyed gardening and tree farming. Memorials may be made to St. Mary’s Episcopal Church, 519 Champagnolle, El Dorado, Arkansas.